This week's song is Steppin' Out with My Baby performed by Fred Astaire in Easter Parade (1948). There are plenty of candidates for the inventor of the music video, but Fred Astaire is as good of a contender as anyone, thanks to his groundbreaking work in Easter Parade (1948). The Steppin' Out with My Baby number in Easter Parade had a large impact on pop culture, but Astaire only made the film because of a twist of fate. Fred Astaire in the slow-motion dance sequence in Easter Parade (1948). Astaire and Ginger Rogers were huge stars in the 1930s, appearing in nine successful musicals for RKO Pictures. The pair made a mutual decision to split up in 1939 after making The Story of Vernon and Irene Castle. Rogers had immediate success: She became a box-office sensation with Bachelor Mother (1939), and she won the Best Actress Oscar in 1940 for Kitty Foyle. Astaire's huge talent ensured that he was never out of work, but he was frustrated with his roles, and he especially didn't like playing second fiddle to Bing Crosby in films like Holiday Inn (1942) and Blue Skies (1946). 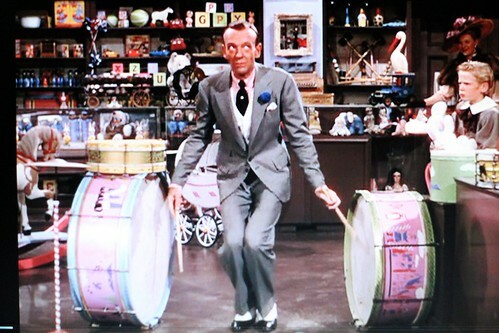 Fred Astaire performs the Drum Crazy number in Easter Parade (1948). Astaire retired after Blue Skies and he was happily supervising his horse-racing enterprise and the Fred Astaire Dance Studios when he received a call from MGM producer Arthur Freed. Gene Kelly, then a rising star at MGM, was slated to play Don Hewes, an arrogant ballroom dancer who picks an inexperienced chorus girl (Judy Garland) for his new partner, but he broke his ankle and the studio couldn't hold up production. Freed knew he needed an established star for Easter Parade, so he and Kelly repeatedly wooed the reluctant Astaire until he finally agreed to play Hewes. 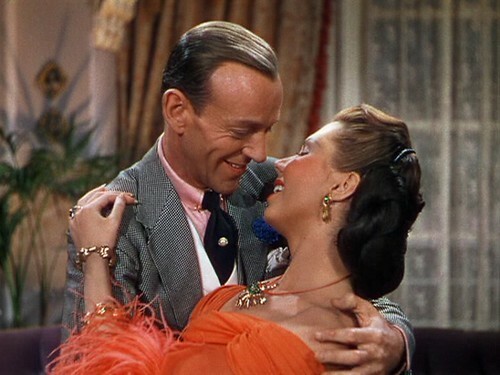 Fred Astaire and Ann Miller dance in Easter Parade (1948). Composer Irving Berlin wrote Steppin' Out with My Baby with Kelly in mind and Kelly and choreographer Robert Alton had already worked out most of the number before Kelly had to bow out of Easter Parade. Astaire was anxious about being able to perform the routine, but that certainly doesn't show up on screen. He is the picture of elegance in his white suit, straw boater hat, and cane. Astaire's dancing is spectacular, especially the slow motion sequence, which has been imitated by everyone from Michael Jackson to the directors of The Matrix. Modern music videos wouldn't exist without Jackson and to his great credit he always acknowledged the debt he owed to Astaire's genius. The lyrics of Steppin' Out with My Baby require a precise vocal style and Astaire, always an underrated singer, nails the vocals. Here's a clip of Astaire performing the entire song. Since Easter Parade, Steppin' Out with My Baby has become a jazz standard. It's now widely associated with Tony Bennett, who made the number one of his signature tunes. Here he is performing Steppin' Out with My Baby.